The Consumer Electronics Show in Las Vegas is jam-packed with the latest gadgets for youthful techies, but one San Diego-based company is showing off its latest digital product for an unlikely user: the elderly. Independa Inc.'s Web platform, nicknamed "Angela," doubles as a telecare and entertainment tool that lets caregivers watch over and monitor their aging loved ones from remote locations. The company used the world's largest tech trade show as a stage to launch its integrated cloud-based services on LG TVs and Samsung tablets. The announcement was made on Wednesday in conjunction with CES’s Digital Health Summit, which aims to solve problems plaguing health care by connecting medicine and technology. Independa was one of 3,000 exhibitors at the Las Vegas Convention Center. Senior centers encourage independent lifestyles, but the No. 1 issue for the elderly is social isolation and loneliness. Independa solves that problem by turning the TV into an interactive realm. While watching favorite TV shows, users can click the remote to access medication reminders and activity calendars with jumbo fonts and icons. Angela aims to engage grandpa, too. Users can video chat a family member, get juices flowing with cognitive games or reminisce with photos in picture frame mode. “We’ve turned an appliance that individuals — particularly the elderly — are very much in front of all day long into a portal for social engagement,” he said. Since computer skills aren't needed, seniors can hop on what is a historically uncharted territory among older demographics: social media. “They can get into email and on Facebook without even knowing anything about those systems,” he said. The app features a variety of reminders, for getting dressed, going to an appointment, brushing teeth, paying bills or weather updates. Last week the company closed a Series A funding round of $5 million, which will be used to expand its network of distributors and channel partners and do more research and development. Money came from health care investment firm City Hill Ventures, a previous investor, and strategic partner LG Electronics USA, with participation by additional investors. Independa's Angela platform is embedded on LG's Pro:Centric-enabled commercial televisions. The debut is a long time coming, with both companies collaborating more than two years on the TV. Independa's product had been in development more for three years when it made its big debut at the Digital Health Summer Summit at the Omni San Diego Hotel last year. For the first time, a summer version of the event was tacked on to speed up the quest of making digital health enable better health. Demand is coming from home care, senior living facilities and home plans. Seniors can use the technology via a standard telephone, as well as through Angela running on a TV or tablet. Saneii said the U.S. health care system needs to take a more personalized approach in order to slash spending. “We should go from patient to person, hospital to residence, whether home or in the facility, volume to value, and more importantly, we should go from sickness to wellness,” he said. To monitor health, the program relies on sensors that transmit information about user activity to the cloud. From there, the right people are notified. “If someone is out of bed six hours late, that is equally as important as if their blood pressure went up,” he said. 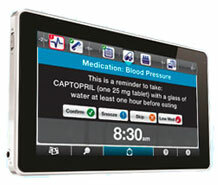 If the user takes a certain medication, the app reminds patients about dosage and when to take the medicine. A timeline on the Angela screen shows when to take medicine at what time. The technology is now also accessible with Samsung Mobile Galaxy Tab 2 tablets under a new agreement with Samsung Mobile.